Memoir moves at a different pace than fiction. Characters and plotlines push the narrative forward, usually toward an actual or emotional climax. A standard novel has a rise and fall. I am sure many of us remember the plot diagram from an English class in our pasts: Rising Action / Climax / Falling Action or “denouement” if you prefer the French term. But this is not the case for A Report from Winter. Wayne Courtois weaves a story of great introspection. Set in the harsh January climate of Portland, Maine the reader enters into the insular world of the narrator. He returns home after a decade-long absence to be with his mother who is dying of cancer. If you think that the weather is severe—Courtois’ relations put the snow and ice to shame. Two things were immediately clear to me as I read A Report from Winter: Courtois has an incredible eye for detail and an incisive, almost surgical sense of humor. The narrator’s snarky comments had the ability to lighten the prose when they became oppressive and also wound those around him. Humor served as both shield and sword throughout the memoir. The greatest struggle I had with this book was its singular, almost needlelike point of view. While memoir is almost entirely told from the perspective of the one writing it, Courtois’ narration was sometimes suffocating. Much like the snow globe on the cover of the book, I was unable to escape the grinding weather and family interactions narrated from only one voice. This is one of Courtois’ strengths; his voice is powerful and convincing, but it also tipped the memoir into a place where the speaker overshadowed everything else. Courtois’ writing is at its most luminous and open when he uses flashback to punctuate the book at several points. The memory of another snowbound night allows the other family members in the book to breathe and interact. It is one of the few places in A Report from Winter where I can hear the other people speak in their own right without too much of Courtois’ perspective drowning them out. Perhaps the short duration of time recounted in the book has to do with the disconsolate weight that is laid upon the reader. 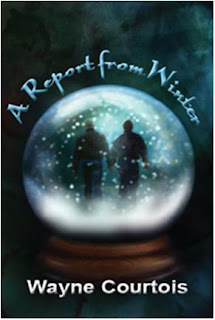 A Report from Winter is not a light read to take with you on vacation. It is a hard book to plow through emotionally. The family’s rough edges and glaring flaws are present and at times stepping into their world makes you want to step out of it just as quickly. It is a well written book that I wish was given more space to speak beyond Courtois’ short trip back to Portland, ME.